A happy Thanksgiving to all our readers. As the red wine cranberry sauce chills in the fridge and MrsDarwin roasts vegetables (no, we're not dispensing with the bird, but we're heading over to a large gathering to which our contributions will be cranberry sauce, roast veg, stuffing and beer) it occurs to me that while the culinary aspects of Thanksgiving continue to go strong in modern America, the reason for taking a day in November to give thanks for our blessings seems arbitrary -- other than opening the "holiday season". This is one of the ways in which our modern society has become much removed from the rhythms of agriculture -- and I would argue from the natural rhythms of life generally. In a modern supermarket, all produce is available year round, fresh and ready to eat. Nor is there any real doubt that food will always be there. If you don't have food, the feeling goes, it is because someone is denying you your rights. In a society in which people are closely dependent on the local harvest, there was real and immediate reason to be thankful once the harvest was safely gathered and stored. Plenty was worth celebrating and being truly grateful for, because there was the ever present possibility that a bad harvest would result in widespread hunger. 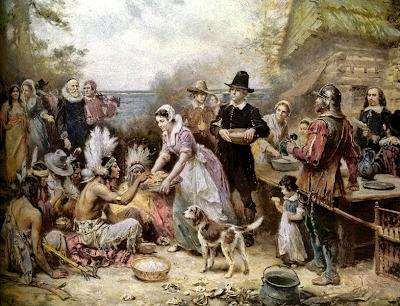 As we survey the groaning banquet table this afternoon, we modern Americans would do well to recall that food comes from somewhere -- and indeed that it either comes or it doesn't. One may talk of rights to food and shelter and medical care and such all day long. But at the most basic, human level: our existence and comfort depends on those who till the soil -- and to all others who, dealing in more modern trades, produce the things we have or desire. I hope the Darwins had a blessed, happy Thanksgiving Day!! Happy Thanksgiving, Mr and Mrs D and family! By taking food for granted, and not really worrying about where it comes from, we leaving ourselves vulnerable. What are the processes that are used to provide us with something we need constantly, every day of our lives? Are they sustainable? Are they safe? Are they fair for the people doing them? Are they changing, and if so, how? What are the threats to future food supply? Perhaps thanksgiving should be a day we set aside to think about some of these things.